Amazon has ordered a third season of their animated kids show, Tumble Leaf. It’s unclear how many episodes have been ordered this time around. The first and second seasons have had 13 episodes each. Six installments of the second season have been released so far. 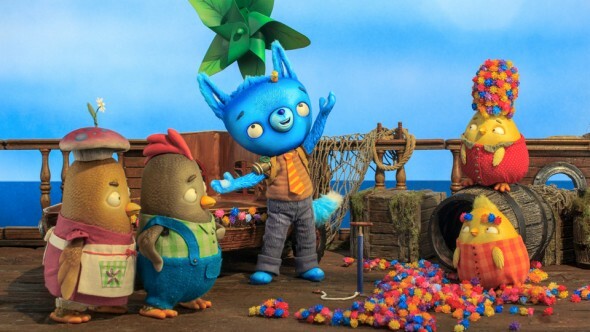 Created by Drew Hodges, Tumble Leaf is a stop-motion series that features a blue fox named Fig, his caterpillar friend Stick, and other residents of the island of Tumble Leaf. Episodes focus on helping preschoolers learn basic science lessons. The cast includes Christopher Downs, Brooke Wolloff, Jodi Downs, Landon Clay, Addie Zintel, Gary Littman, Alan Franzenburg, Emily Downs, and Steve Downs. Amazon has also renewed drama Hand of God, drama The Man in the High Castle and dramedy Red Oaks for second seasons. What do you think? Does anyone in your home enjoy this program? Should it have been renewed? Do you recommend it? Tumble Leaf is one of the few shows that I don’t mind watching over & over, with my 2 & 3 yr. old grandchildren. Having fun with (mostly) simple objects. We are OBSESSED with Tumble Leaf… I hope there are many more seasons to come. We love this show and so excited about another season. There could never be enough shows for my 5 and 2 year old. It’s an easy decision what we’ll watch. Our whole family is so excited there will be a 3rd season and hope the 2nd half of season 2 will be released soon.Finally a show we can all enjoy. Thank you!! My two year old LOVES Tumble Leaf! She asks for it by name. I have not seen any other shows that match the quality. We have even used some of the episodes to describe what and why thing happen in her life. She had become a smarter child because of this show and i just want to say thank you for making more episodes. Tumble Keaf is a great children’s show. It has discoveries, ideas, problem solving, friendship and I love that it’s calmly paced. Love tumble leaf. Make as many as you can, please. WE LOVE Tumble Leaf!!!! Great educational show for kids 🙂 If we do any screen time at all… Its Tumble Leaf! Tumble Leaf is a great series for kids. Much better than the Mickey Mouse Club or similar shows. I’m glad it’s getting another season.